EXCLUSIVE TO TAWK MEMBERS ! The caravan parks, camping spots, farm-stays and accommodation places here are 'Supporting TAWKing'. They have realised that many families are now Free Camping as much as they can and NOT staying in caravan parks due to the EXTRA cost of paying for the children. The following are 'Supporting TAWKing' and offering to TAWK Members: 'Children camp at least two nights FREE!! '** (Some offer more!!). Click here to find other states. Discovery Parks WA - 10 Separate Locations Throughout WA! Summerstar Tourist Parks - 7 Separate Locations Throughout WA!! Oh you are going to love it here AND I'm excited to say that they contacted us to become TAWKer Supporters, I think that that means they are truly interested in welcoming and helping travelling families with 2 nights FREE camping for TAWK Member's kids! 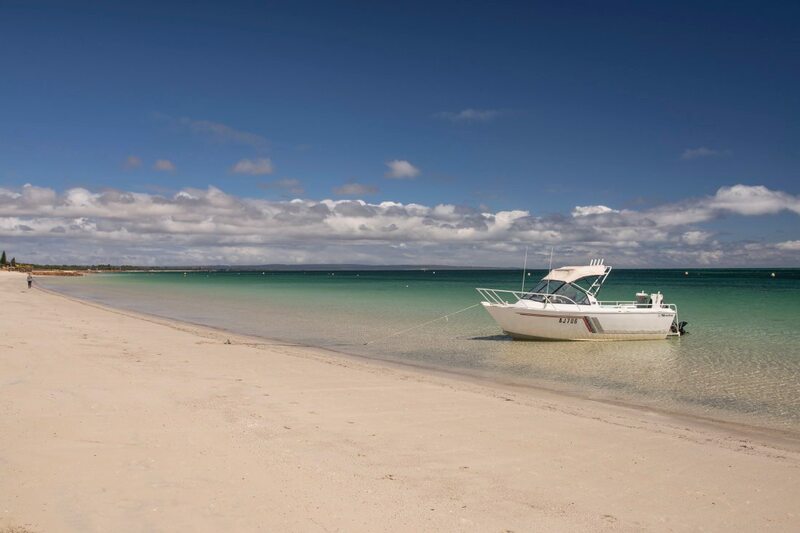 Amblin Holiday Park is nestled in Geographe Bay at Busselton, and seriously has the most beautiful beaches. You can get some excellent fishing in and explore the area. Let's face it, we've all seen those amazing photos of Busselton Jetty so a perfect spot to base yourselves to get your own! 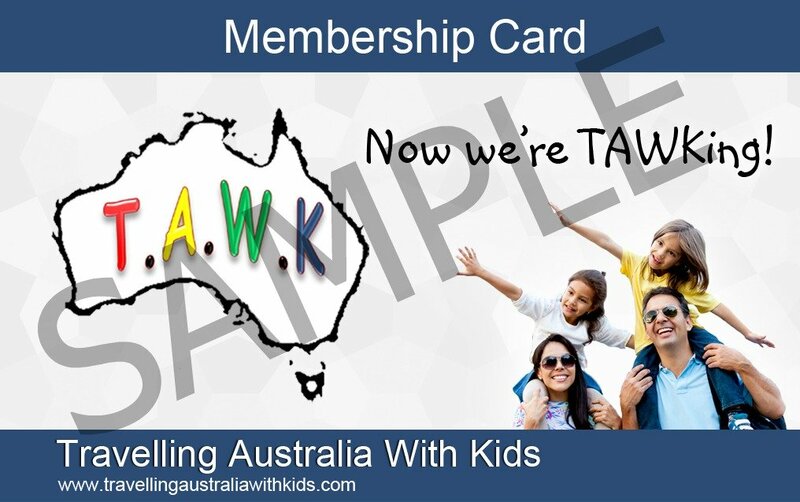 Show your TAWK Membership card and support them supporting you. For more info on their facilities go check out the Amblin Holiday Park Website - and and check out their pool. This which was a pre-requisite for my kids if we stayed at a park. Often fellow TAWKers find their way back to the lifestyle that they have enjoyed while travelling by buying a property and turning it into a camp spot or managing a caravan park. When they embrace the latter, they know what's important to other TAWKers AND how expensive it can be when staying at parks. This is what happened at the Boddington Caravan Park and we were approached by them to become part of the TAWK Support Program. They would also like to offer TAWKers 3 night's FREE camping for your kids! Oh what a spot! I was very excited when Cheynes Beach Caravan Park contacted us to find out more about our TAWKer Supporter Program. To us, that means that they embrace families in their park and we love family friendly parks. 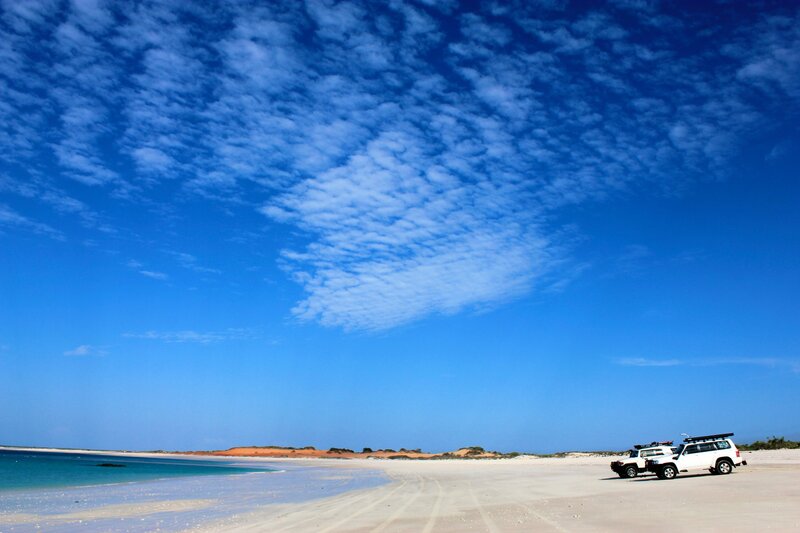 Cheynes Beach is a gorgeous protected cove, just a 45 min drive from Albany and 75 mins from the Stirling Ranges. The beach stretches forever with aqua blue waters and sparkling white sands! It's breathtakingly beautiful and virtually unspoiled. There is seriously so much to do here for you and the kids that you really need to check it all out here on their website. It's all that back to basics stuff of just enjoying your surroundings. From whale watching to fishing and sand boarding, 4wd-ing and kayaking. Seriously a great spot to stay a while. In the whale watching season, the whales coming right into the bay. On a calm day you can hear the whales tail flapping and blowing from the Caravan Park! 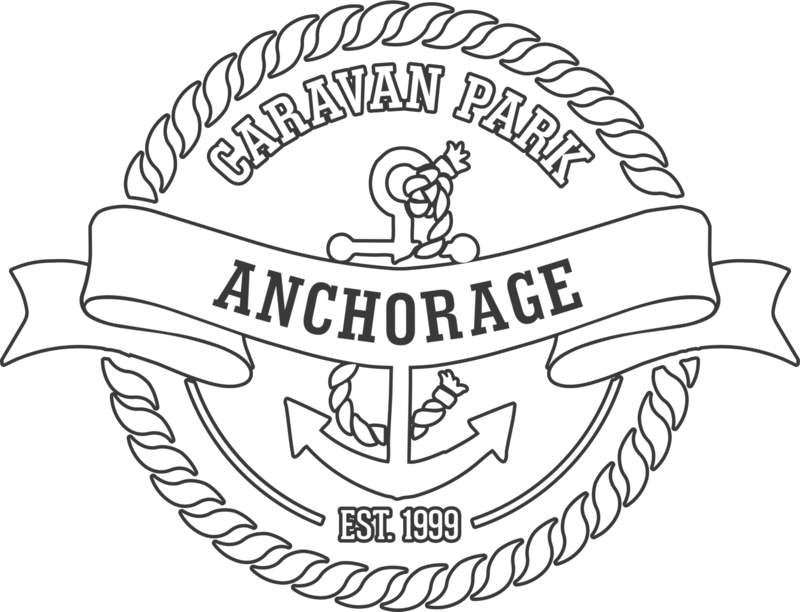 As a TAWK Member, you will get 2 night's FREE camping for your kids* So make sure when you are in the area, you visit this awesome spot and support Cheynes Beach Caravan Park supporting you! * Offer not available during school and public holiday periods - check with park for details. One of our favourite places in WA that we stayed is Denham which is situated in the world heritage listed Shark Bay area. What a great town we found Denham to be, and the perfect spot for us to explore the area. The Heritage Centre was a highlight as was Ocean Park Aquarium - always great to get some education into the kids without them realising it! We also based ourselves here to visit Monkey Mia - which is just a short drive away. When Denham Seaside Caravan Park said that they would like to join the TAWK Supporter Program we were stoked! We actually stayed at this park too, so happy days as I know it well. The absolute water front sites have amazing panoramic ocean views. Shark Bay is just sensational and the park has it's own lovely safe beach. There is also a lovely little jetty close by and my kids loved fishing off of it. The park is a short walk to pretty much everything in the town and that walk along the ocean... ahhhh I just sigh thinking about it now! So grab your TAWK Membership Card and show it on check in to get 2 night's FREE camping* for your kids. I'm sure you and especially the kids, will love your stay in Denham, so please support them supporting you. *Not available all school or public holiday periods, please check with park. We are so excited that Discovery Parks are dipping their toe into the TAWK Supporter Program in WA. Hopefully this will be the start of something national and we can get all the states involved. Being one of the bigger groups in Australia, it is great that they see value in helping make it more affordable for travelling families to see our amazing country. Not all parks in WA are on board (yet!! ); Ten are however, so make sure that you support these and hopefully it will snowball. They have some great family friendly parks and welcome TAWK Members with 2 night's FREE camping for your kids. Below are the parks on board so far. If you book online you can pop in the promo code TAWKING and the deal will automate itself OR if you call them to book directly or turn up, mention the TAWK Membership on booking to get TAWK deal (the tech dept is working on the auto booking at the moment). Please be aware that there may be a teething period as all parks get used to you using the TAWK Membership and contact us with any issues, plus only one discount card can be used per booking. Make sure you show them your card and support them supporting you! I was so so happy when a TAWKer family spoke to the management here at Kalbarri Anchorage Park about the TAWker Supporter Program and they contacted us to become involved. We always stay at this park when we go to Kalbarri, right on the river, relaxed with lots of room and the kids love the pool. The perfect spot to base yourselves to visit the amazing area. Not only the most spectacular coastline, but the fabulous Kalbarri National Park and all the gorges. Not to mention the iconic Natures Window, where it's almost a right of passage to get your photo here. When we first stayed there, it was one of the parks that we felt truly for the first time that we were really welcome as a family. AND a row boat trip along the River Murchinson to Chinaman's Peak led to our first TAWK Pose!! I truly love this area and you will too! 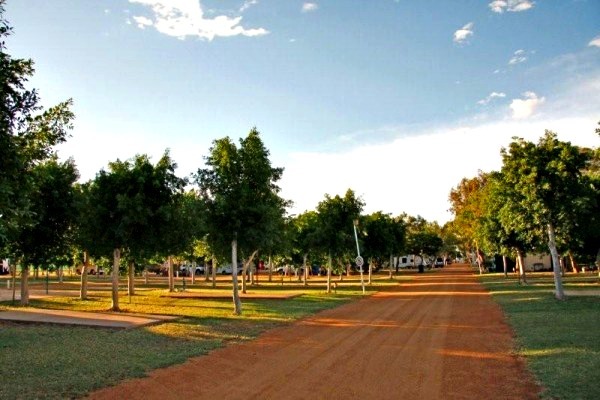 Karratha Caravan Park is another of the AAOK Group of parks committed to helping travelling families with FREE camping for the kids of TAWK Members - yep I said FREE! There are plenty of shady and quiet caravan sites with spotless amenities, a BBQ area with free gas BBQ's and a cafe and bottleshop onsite! You can also bring your dog, so grab your TAWK Membership Card and take advantage of the FREE camping for your kids and explore the area. Luckily for us we have TAWKers that travel and manage different parks as they travel, so of course they know the benefits of the TAWK Support Program and that makes it all a lot easier! So we are all excited to welcome The Ivanhoe Village Caravan Resort to the program. The park is the perfect spot for exploring this amazing region. The Kimberley still is one of my favourite spots in the whole of Australia and once you have been, I'm not sure it even leaves you....BUT enough of me! Their aim is to ensure your stay here is so comfortable that you’ll never want to leave, and so memorable you can’t wait to return, so be careful TAWKers you might stay a while! Luckily they will help with that and offer TAWK Members 2 nights FREE camping for your kids! Check out the pool already. The kids will love it! You can find out more here and don't forget to grab your TAWK Membership Card. 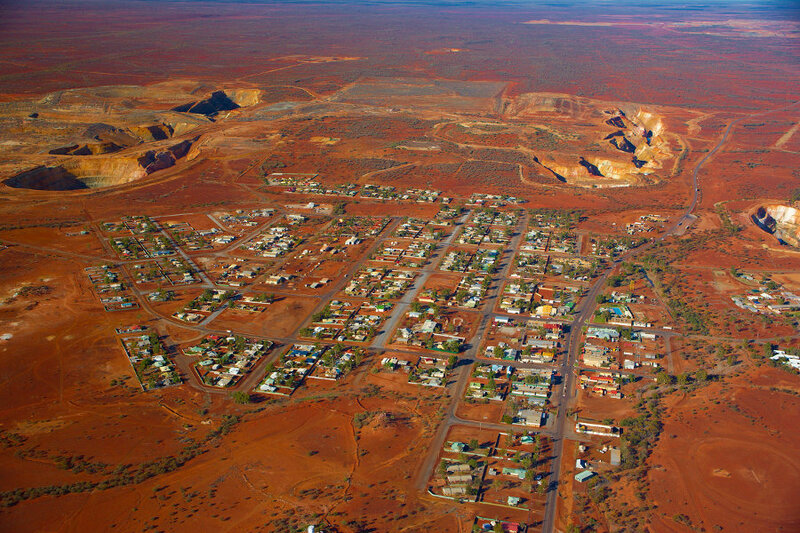 Ahhhh The Kimberley It is my favourite part of the whole of Australia and one no doubt, you will wish to visit too. Luckily, there is some cheaper camping to be had. 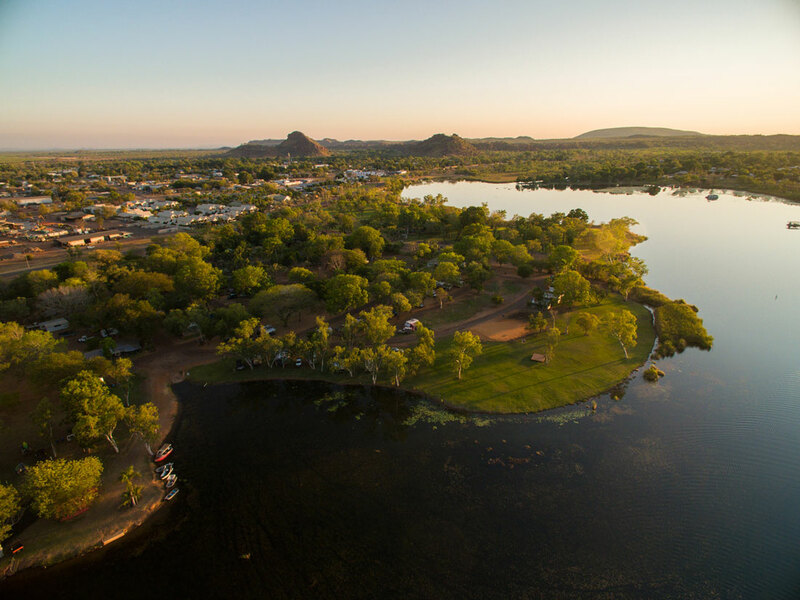 Kimberleyland Waterfront Holiday Park is in Kununurra in the East Kimberly region. It is the eastern entry point of the World Heritage Listed Bungle Bungle Purnululu National Park AND the Gibb River Road. 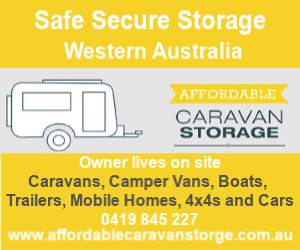 If you are thinking of doing the Gibb River Road, but might not be fully off road capable, you can leave your caravan here, grab your tents and know that your van will be safely stored. There's a lot of facilities at the park, too many to list but do go and check them all out here on their website, for now I'm just going to say Coffee Shop AND a Tropical Pool! Me and the kids happy right there! 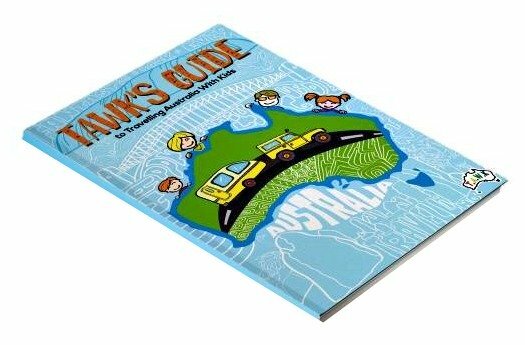 Offering TAWK Members 2 night's FREE camping for their kids, school holidays, kids stay FREE for their ENTIRE stay* So grab your TAWK Membership Card and support them supporting you! The WA coast has to be on your list when you are travelling our gorgeous country and we are excited to welcome the BIG4 Ledge Point Holiday Park to the TAWKer Supporter Program. They were recommended by a TAWKing family who loved their time here, we approached them and they said YES! It truly is a remarkable spot and a great base to explore the famous Pinnacles, do some fishing off the Ledge Point groin, hit the sand dunes (my kids love doing this) and drive the 4wd tracks and at the right time of year enjoy the gorgeous Western Australian wild flowers. So grab your TAWK Membership Card and show them when you check in to get your 2 night's FREE camping for your kids* and support them supporting you. Oh, if you are travelling with your dog, then at managers discretion you can bring him/her too - just not at peak periods. Every now and again, you get a park that ticks ALL the boxes and Mandalay Holiday Resort and Tourist Park does just that! Great to have another resort on board recognising the TAWK Supporter program and offering TAWK Members 2 night's FREE camping* for their kids. AND boy will your kids love it here! Mine did so much, they loved the pools, yes plural! Infact there is sooo much for the kids to do, your really need to check it out yourselves here. Sometimes that's all the kids want to do, is just chill and have fun for a while. Exploring is good, learning is good but just relaxing and playing is equally good to. So when visiting the gorgeous Margaret River Region (and the staff here are more than happy to help you discover the area), it's a perfect spot to base yourselves and get the best of both worlds. Grab your TAWK Membership Card and present to the reception at check in and support this great resort supporting you. *Not available school holidays, or public holiday periods - this resort is exceptionally busy with locals so unfortunately they are not able to offer the TAWK offer Friday or Saturday nights. The Peel region itself is great to explore and when you return to the park there is almost as much in the park to explore. Have a look here at all that is available to you and the kids. I know mine often needed to just stay at the park sometimes and play in the pool and relax, well here you can. They are keen to offer 2 night's FREE camping for you kids*, so grab your TAWK Membership Card and support them supporting you. *Not available at all school holiday periods, check with park directly for details. 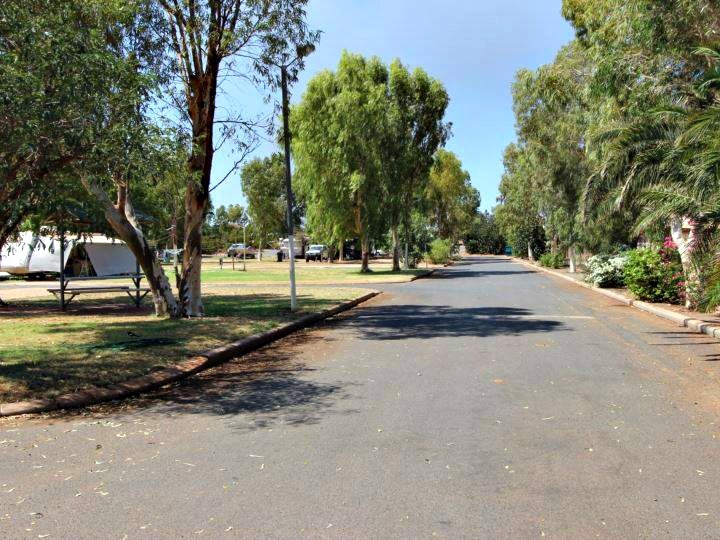 Meekatharra Accommodation Centre is another of the AAOK Group of parks committed to helping travelling families with FREE camping for the kids of TAWK Members - yep I said FREE! Now it's not an obvious spot to stay for travelling families, but sometimes you need a spot to stay on your way around our gorgeous country and this might be handy with the FREE camping for your kids. 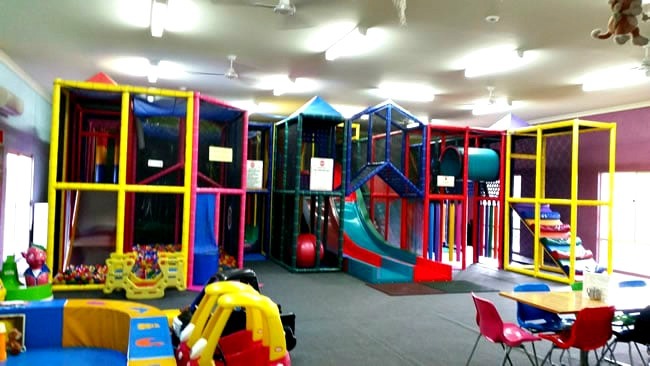 Meekatharra Accommodation Centre also offers a service station to fill up, a lolly shop and a takeaway cafe and restaurant with excellent food. Dogs are welcome. So grab your TAWK Membership Card and take advantage of the offer. So, so, sooo many families kept recommending Nanga Bay Resort and Caravan Park that we knew we needed to invite them to join the TAWK Support Program. It was an easy decision for them as kids under twelve stay free anyway. This is my favourite type of camping and as long as you understand the beauty of back to basic camping you and the kids will love it here. The fish are always biting, the sunsets are stunning and just take a look at your view! Nanga Bay is an outback bush resort that is run on generators and Artesian bore water. They do have a shop with basic supplies, there is also a spa, a pool, restaurant, bottle shop, and the most beautiful beach. Just note the bore water is NOT suitable for drinking but is used for showers, laundry and washing facilities. It also causes rust-like staining but is not a health concern. Please ensure you bring adequate drinking water with you although fresh water is available to purchase from the Office. Make sure when you visit this gorgeous park of WA to pop in and stay a while. Show them your TAWK Card so they know that we sent you and support them supporting you. Another great location recommended by a TAWKing family - we approached them to become TAWKer Supporters and without hesitation they said YES! Oakabella Homestead is in the Midwest of Western Australia. Set in a dramatic landscape, this must see location offers spectacular vistas including Elephant Hill, Table Hill and the ancient gorge and seasonal water fall in the Oakabella Creek. Wildflowers are also plentiful in the cooler months. The perfect spot to enjoy on your way up or down the WA coast, just off the NW Coastal Highway. 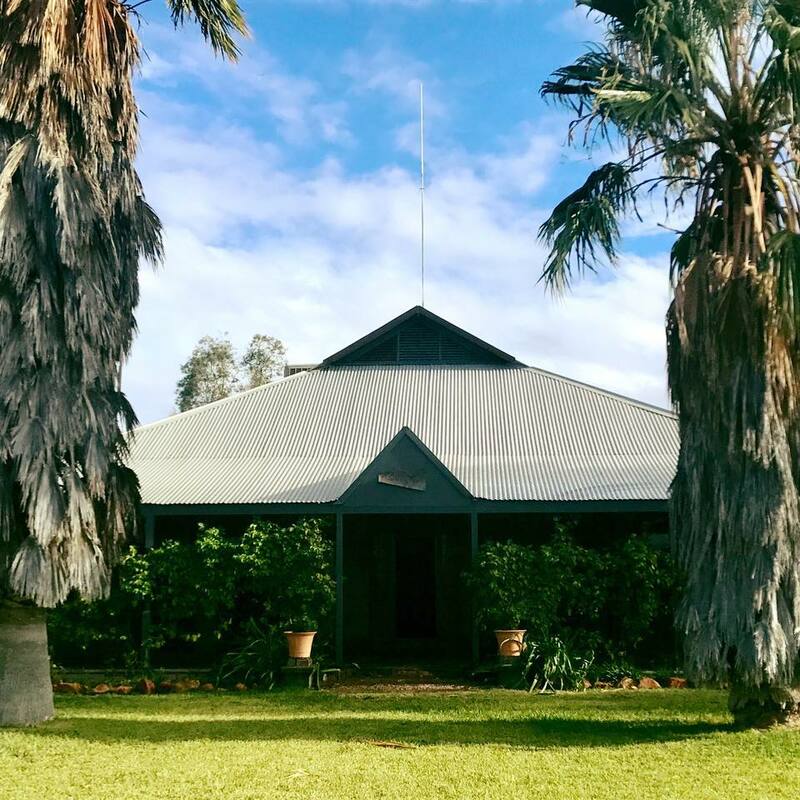 Caravans and Campers are welcome and the Oakabella Homestead is a comfortable stop-over on your journey along the stunning coast of Western Australia. Show them your TAWK Membership card and tell them TAWK sent you. Kids stay for FREE! POP them on your MUST STAY list. Support them supporting you! Parry Creek Farm Tourist Resort and Caravan Park approached us to become TAWKer Supporters and to me that speaks volumes. It means they want you there, they understand that helping to make travelling more affordable by FREE camping for the kids means you will support them. YES! I said FREE camping for the kids. They are close to the Gibb Rover Road AND 40 minutes from Emma Gorge. They tell us that heaps of people do day trips to El Questro from their park so that they don't have to pay the crazy prices there. Sounds like a plan! Oh the other awesome thing is; they have - A POOL!! (Essential in my kids eyes.) AND a Restaurant, they do Woodfired Pizza on Tuesdays and Fish and Chips on Fridays! (Sounding essential in my eyes too!!) It is also open every day in the dry season. 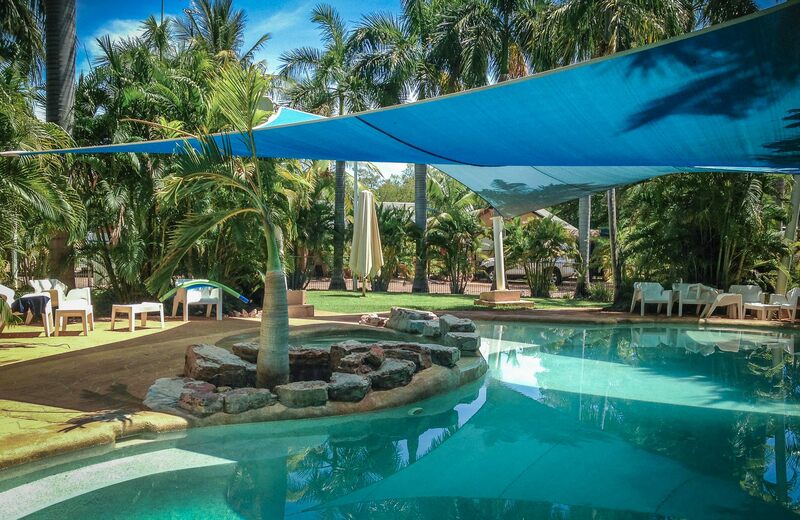 I can see it now, a trip to El Questro during the day and coming back to an easy option at night! OH and if you have your pet with you...they are welcome too! Being in the Tropical North they are only open from April to October, so the dry season. Make sure you show them your TAWK Membership Card and benefit from the FREE camping for the kids. 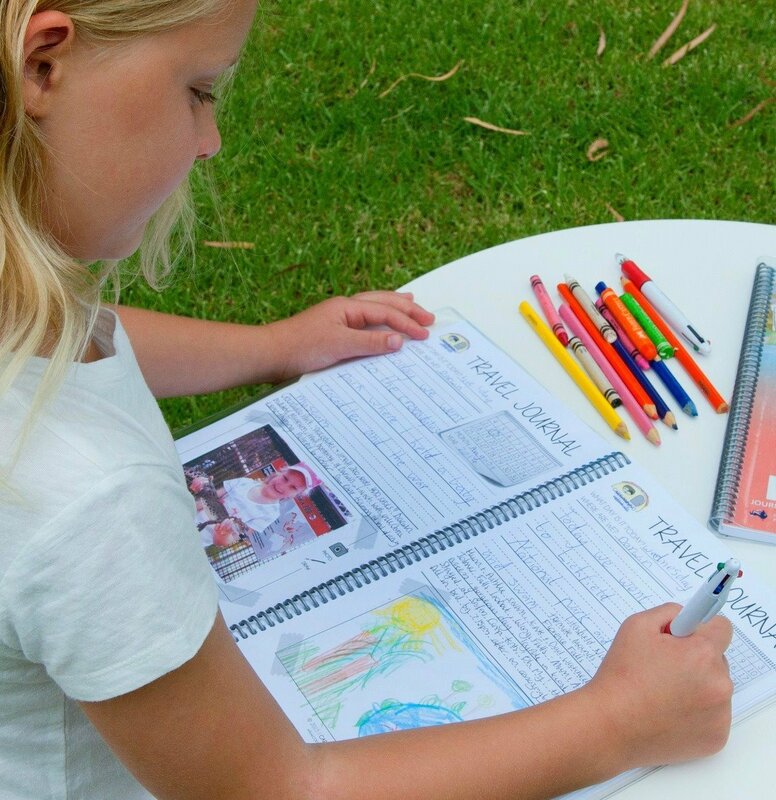 Port Tourist Park is another of the AAOK Group of parks committed to helping travelling families with FREE camping for the kids of TAWK Members - so make sure you grab your Membership Card and save! It's one of those parks that you can utilise to see the area and we did many moons ago. The reception is next door to the park and we thought we'd stay for an overnighter, but ended up staying for a week. The use of washing machines is FREE. Your dog is welcome. There is an onsite restaurant providing buffet breakfasts and dinners with chefs from all over the world. The owner of this park also owns the Walkabout Hotel next door, and has recently installed a kids indoor play centre, which is FREE for patrons. Let the kids burn off some energy! So please support them supporting you. Riverside Cabin and Caravan Park was recommended by a TAWKing family that loved their stay there and suggested to us that we invite them to the TAWKer Supporter Program. We did and they said YES! The Park is located opposite the Collie River on the Eaton Foreshore and only 8kms from the city of Bunbury. They have a solar heated pool already (a pool was always a winner in my kids eyes after travelling during the day) and in 2019 they are also installing a second heated swimming pool along with a jumping pillow & playground = Happy Days! There are paths for you to take a walk along the both sides of the beautiful Collie River & around the Estuary checking out fishing spots to maybe drop a line in during your stay. When you are in the area, make sure you show your TAWK Membership Card at check in to get 2 night's free camping for your kids* and support them supporting you. 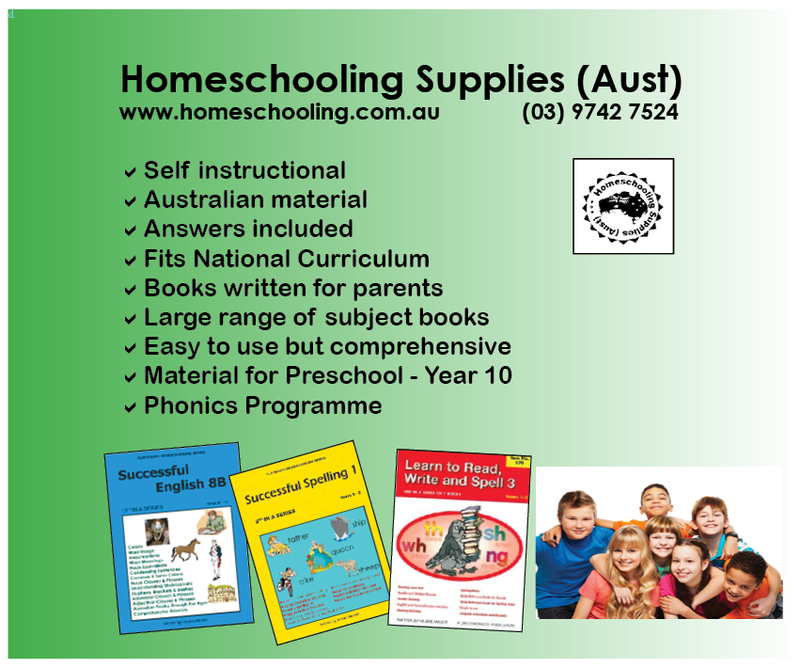 * Not available during Christmas and Easter school holidays or Public Holidays. How great is this!? SIX parks (soon to be seven with Tom Price, soon to be part of the group) throughout WA meaning cheaper camping for you! 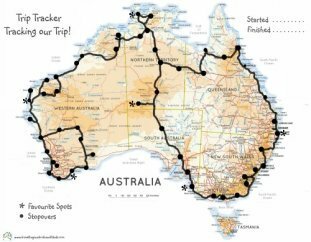 They have seven parks in WA at present AND a few more in the pipeline and because they are nicely spread out, you can pretty much park hop from Esperance to Tom Price! You must tell them you are TAWKing and print/show them your TAWK Membership Card. * Now like many of our supporters they cannot offer this deal in the school holiday or public holiday times BUT let's face it, TAWKers tend to avoid the busy times anyway! They classify children as being under 15. Tallering Station was suggested by a TAWKing family who loved their stay there and thought they would be a great fit for the TAWKer Supporter Program. We contacted them and they said YES! 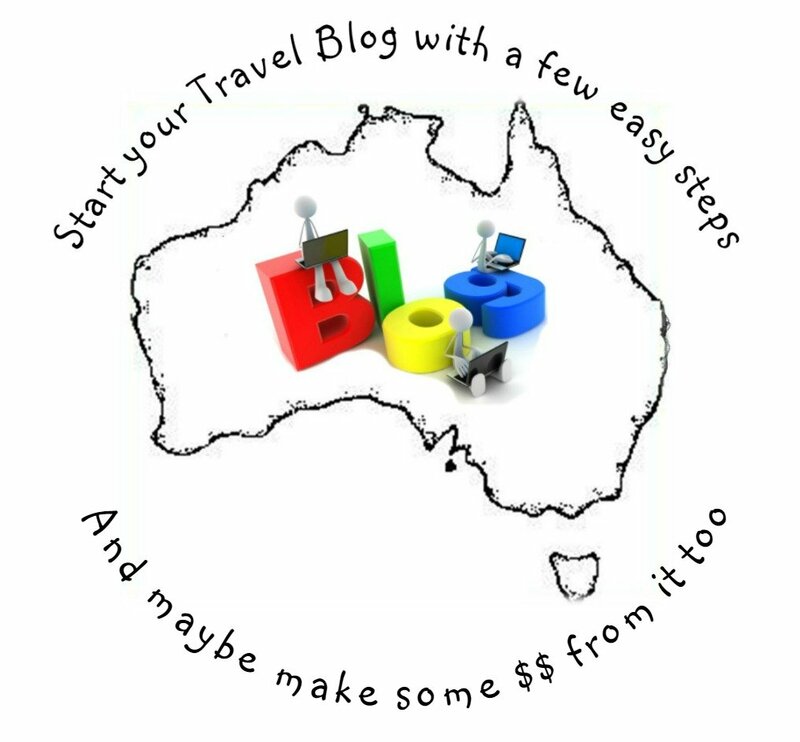 Managed by a young family who recently travelled Australia for 18 months, they have 4 kids, so they truly know how expensive it can be to travel the country - so they would like to offer kids stay FREE! Tallering Station have only recently opened their doors to self contained camping on their property and water is available. They will eventually offer shearer’s accommodation & will have amenities available (they are currently working on them in their spare time) and realistically, they will not be ready until sometime in 2019. They also offer station tours, including checking out all the wildflowers on the station (when in season), sunset BBQ’s and if they have enough interest, they will offer camp roasts at a cost per person. They have a Facebook Page that you can message for more details or you can email them on talleringstation@gmail.com and their phone number is 08 9962 3007. Please show them your TAWK Membership Card and support them supporting you. I was so excited when I got an email from a TAWKer who had been chatting to a rep from WAITOC (Western Australia Indigenous Tourism Operators Council) about the TAWK Support program. They spoke about the great opportunity for families to visit some of the amazing campgrounds in the Kimberley and the amazing cultural experiences that you and your kids could have in my most favourite spot in the whole of Australia, The Kimberley. A few phone calls and emails later and we are so exicted to say that we have 4 campgrounds on board - offering TAWK Member's 2 night's free camping for their kids. Each campground offers you more than just a stay, it's a whole experience and one that I bet you'll never forget. NOW please note, that while all of these campgrounds have some access to WiFi and/or Telstra 4g reception, along the road to all these places phone reception is limited or non existent. Their websites outline how best to book - or if booking in advance is needed (It's recommended to check ahead of time especially Dampier Peninsula - Kooljaman and Whalesong). You will find the links to the respective websites by clicking the links below...... AND of course they are only open in the dry season, generally May - Oct. Make sure you show your TAWK Membership Card to get the discount. Wintersun Caravan and Tourist Park is family owned and operated. All of the staff pride themselves on exceptional customer service and standard of facilities offered at "the park" and I can vouch for that, having stayed there on numerous occasions. (Once when we were evacuated from Coral Bay due to a cyclone in the area!) They could not have been more helpful in assisting and organising everyone in the same situation to get a spot to stay. 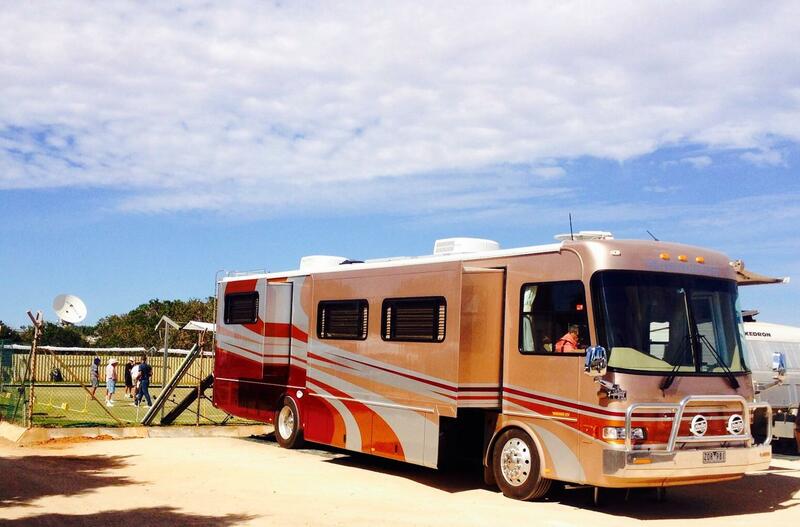 They accommodate BIG rigs and you can bring the dog! I think that you can tell that these guys really are in the right industry as now they are also 'Supporting TAWKing'! Please support them too as you travel the country - find out more here. Ohhhhh! You will love it here! 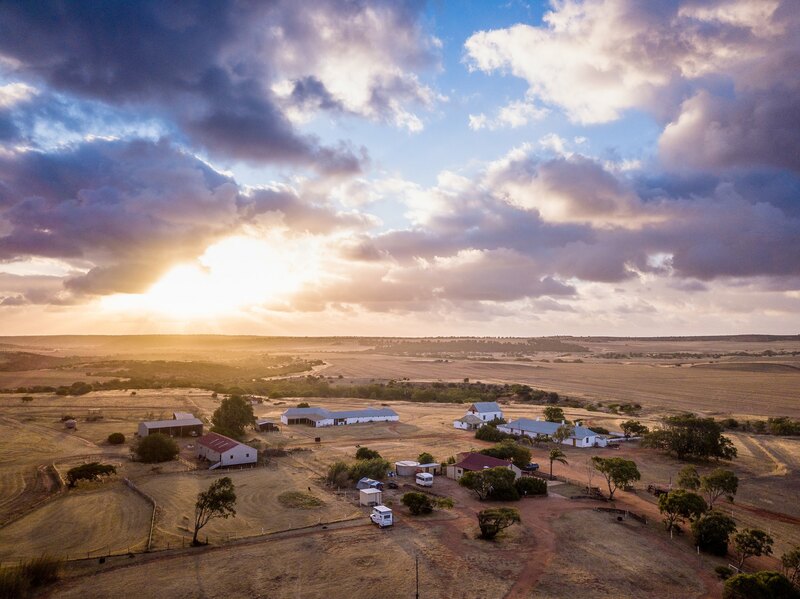 Wooramel Station is a working family property that is 120km south of Carnarvon and 340 km north of Geraldton. 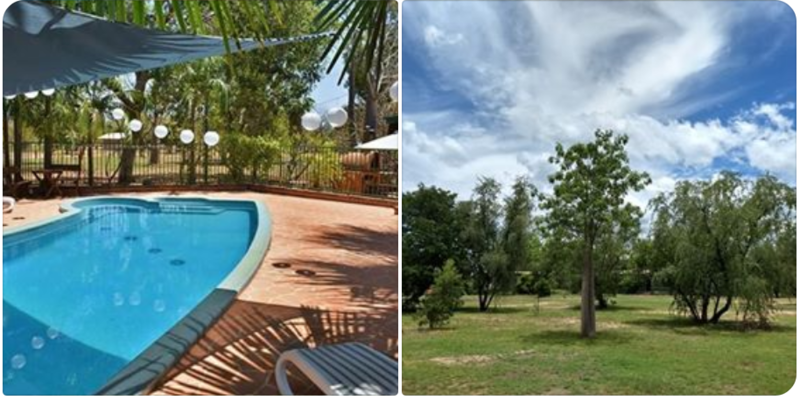 On your way up the North West Coastal highway along the Coral Coast to or from the Pilbara and the Kimberley, you really should pop in and visit Wooramel River Retreat. It's set on the bank of the Wooramel River surrounded by massive old gum trees, it has spacious campsites and fire pits. It's back to enjoying beautiful nature here with an abundance of wildlife and uninterrupted stargazing. They often have a traditional Australian Camp Oven evening and what better way to meet like minded travellers over dinner and a drink. I seriously can't wait to visit myself! PLEASE BEAR IN MIND THEY CLOSE FROM DECEMBER - MARCH annually - check with them for finer details and actual dates. A truly beautiful part of the country and now TAWKer Supporters offering you 2 night's FREE camping for TAWK Member's kids*. 4 naturally warmed artesian spas. Unisex ablutions with warm showers. Camp kitchen and Dining area. Grassed Camp sites or Shady riverside sites. There's so much more that I am sure you will love, so go and check out their website here. When in the area, please support them supporting you.